Browsing through the ShareFair programme you might have noticed that every session has a number, and you probably asked yourself: “what is the logic behind these numbers?” Someone asked me if it signified number of minutes of each session. Well, the answer is no, I believe that would have been very unfair to proposal number 1. It is actually a very simple logic behind the numbers. As you all know by now, the ShareFair Steering Committee received 300+ proposals for this year’s event. 300+! 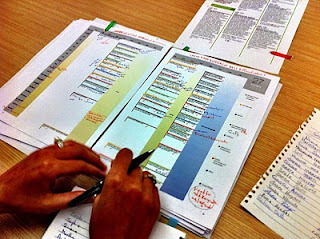 We were thrilled by the number of proposals, and needed to have a solid system for keeping track of them during the thorough selection process. Patti (who I have voted to be the Steering Committee’s most structured person) suggested immediately to give the proposals fixed numbers, and so we did. The numbers are simply the unique identifier for the proposals, based on the first list we received. Nothing more, nothing less. When I think back at the first version of the Excel list, I am very excited and happy to see how our graphics team has shaped it into this beautiful programme that you are holding in your hands today. All these numbers, names, links and comments have been turned into a colourful, easy to read overview of the event. It should be easy to find an select the sessions that interest you the most. On a personal note, what I am looking forward to the most, is to finally meet the people behind the names and numbers in this list who have been our companion for the last couple of months. I am looking forward to finally attend their sessions, and to listen to their stories in person. Taking this event from paper to reality has been an intensive but fun journey, and I hope the coming days will reflect this.